If you are looking for a home in Highland Lakes and are not considering this house, you may be missing out on the neighborhood's best value! The Springfield plan with kitchen breakfast counter open to the casual dining and family room, one of the largest master suites with vanity wide enough for dual sinks, nice size dressing area and walk-in closet is one of the easiest floor plans to update. There is an inside laundry room. 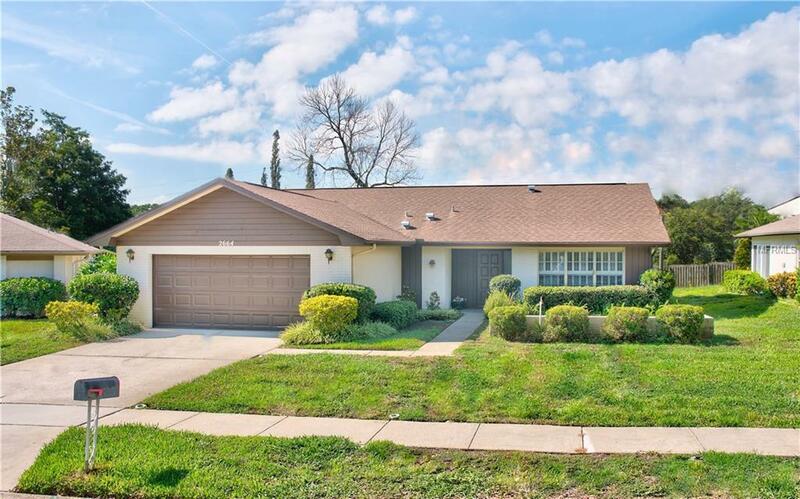 Nearly 1700 square feet of light and bright space, a two car garage, and a lot with no rear neighbors and a pretty lake fountain view on a quiet cul-de-sac. New Trane 3-ton AC and reclaimed water for the irrigation system. Yes, it needs cosmetic updates so that means you get to choose your own colors and materials. You will love Highland Lakes! The community offers the lifestyle of a comfortable country club for a great value. A huge clubhouse with auditorium hosts more entertainment and social events than will fit on your calendar. Residents enjoy free golf on 3 professionally maintained executive courses. Additional amenities include two heated pools and a spa, lighted tennis and pickle ball courts, bocce and bowling leagues, the Lodge on Lake Tarpon, boat ramp and fishing pier, free RV or boat storage in a secure lot, and multiple fitness classes, card groups, and interest club activities. Blissfully close to world class beaches, fantastic shopping and restaurants, two major airports, and excellent medical resources. Come live the good life today in Highland Lakes of Palm Harbor! Additional Water Information Community Pontoon Boats On Lake Tarpon Fishing Pier Secure Boat/Rv Storage Lot And Community Boat Ramp.